So recently, I got an e-mail from Diana asking if I could draw a dress for a roleplay she was taking part in. I went through and read the scenario, and Diana’s character Leslie is a human spy in a magical world who has to infiltrate a masquerade ball attended by aristocrats. So I thought this was a fun challenge: what sort of thing might a spy wear to such a ball? It’s dead easy to make a gown that says “hey everyone, look at me!” or one that says “I am a Woman of Mystery” but one that looks expensive and magical enough that no one questions its wearer’s right to be there, yet isn’t so noticeable that everyone winds up talking about her… fun. I ended up going with blue, a rich but soothing color, and an overskirt with fabric like shimmering water and seafoam, studded with crystals — although I don’t really think the crystals worked out too well. Oh well. Diana, I hope you like it anyways, and I look forward to seeing where the story goes! Muahaha, Leslie will be more than surprised! It’s beautiful! Maybe the best thing about paper dolls is dreaming about all the beautiful clothes we would wear if we could! Beautiful. I love the water like fabric of the overskirt. Oh, my! What a dress! It’s absolutely one of your best, I think! please draw more olden day dresses like these because they’re so pretty! OMG i love this! I want it sooo bad! Its the best one on here! OMG!! IS THERE ANY WAY TO BUY THIS DRESS??? or maybe a pattern for it? its soooo pretty!!! I am writing a book, and in my book there is a masquerade ball for halloween. 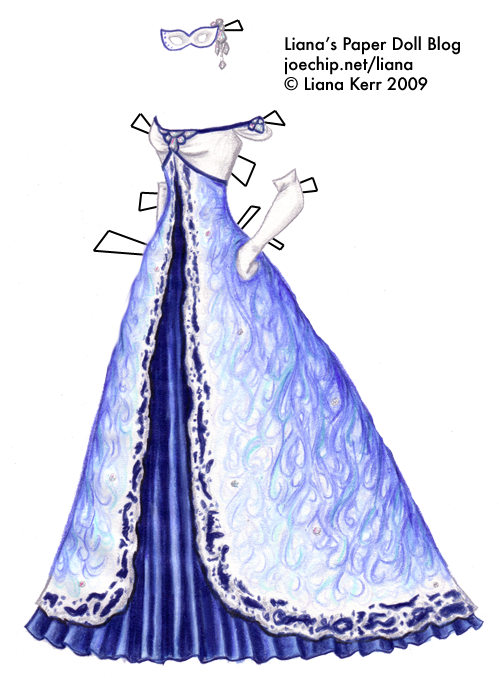 i was looking for some ideas for dresses and i really like your designes. they are sooo beautiful (not sure what i like best yet). Anyway, to get to the point i would permission like to use your dress as her gown. It’s beautiful, if it was my size and real i would definitely wear it. So serene and peaceful looking. Hey there! :) I just wanted to say that I really admire your artwork- you’re extremely talented, and the dresses are gorgeous! ^_^ I used to come to your blog, and print and cut out the dresses to play with, and seeing it again has actually inspired me to get back into paperdolling!